Chicago is a town built on industry and transportation, much of which relies heavily on Lake Michigan—a body of water that without argument provides a large portion of the city’s identity to locals and foreigners alike. Even though this characteristic about the windy city could be considered common knowledge it is still an interesting facet of its history worth delving into. I can envision this multifaceted history sparking all kinds of investigations and artistic, research-based inquiries into the history or future of this city. 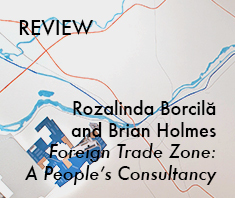 Questions like: how did the evolution of industry shape Chicago’s economy; when locational labor is moved, what moves with it; what kind of freedoms are afforded to a “foreign trade zone?” It is unclear, however, if that is what Rozalinda Borcilă and Brian Holmes did in fact do with “Foreign Trade Zone: A People’s Consultancy” in the project space at Threewalls. 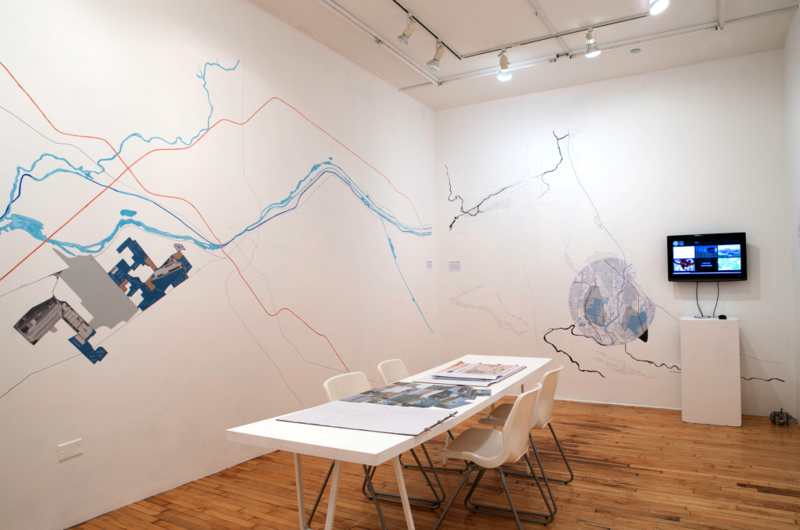 Rozalinda Borcilă and Brian Holmes, “Foreign Trade Zone: A People’s Consultancy,” 2014, installation view. Courtesy of Threewalls, Chicago, IL. This work has three major components—an installation in the project space, an extremely active events schedule consisting of walking the areas of Chicago under investigation, and a website where the bulk of the project lives. The overview of this work is described as “reflect[ing] on the historical developments and present-day realities of ports, warehouse districts and transit corridors, asking why and how Chicago’s lakefront and waterways went ‘offshore.’” The title, “Foreign Trade Zone,” attempts to package this industry based in logistics with FTZ’s, zones used in foreign trade that are afforded certain tax allowances to encourage U.S. enterprise. 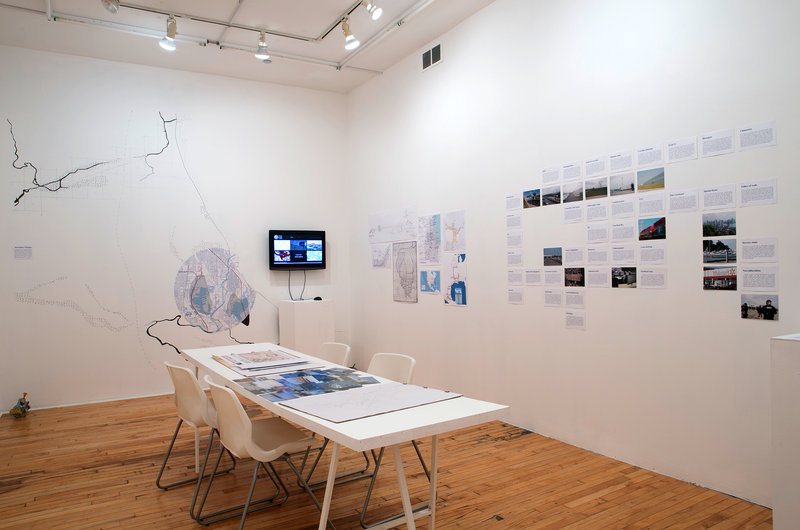 The transition between historic and contemporary Chicago is a line that is not easily visible or indicated throughout the installation, and the argument of why these systems went inland or how the significance of an FTZ’s influence over capital shapes trade economics are not examined in an attainable way if at all. 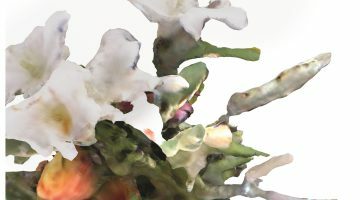 Inside the project room one is met with six poster-sized, landscape-oriented photographs depicting the edges of the systems Borcilă and Holmes are presenting. On one wall these photographs are hung with map pins, their white borders visible. 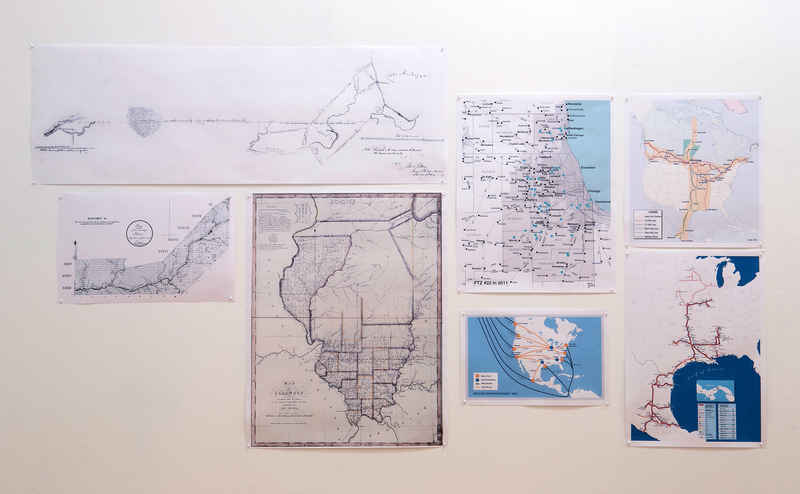 Hand drawn maps of waterways and trade routes take up residence on two other walls. These maps are labeled as “historical view,” drawn from documents and accounts from the early to mid 1800s, and the “corridor map” highlights transportation routes leading to a hub of logistics outside Joliet, a suburb of Chicago. The fourth and final wall resembles something one might find in an elementary classroom studying social studies. Printed images of maps both old and new depicting the state of Illinois, various trade routes, and more waterway transport systems are hung salon style next to index card sized photographs and text boxes neatly arranged in a grid-like structure. In the center of the room sits a table with four chairs. On the table are more maps faceted together and a pile of photographs just larger than a postcard. These images installed throughout the space are superficial to the project, which largely resides on the World Wide Web. A computer is provided in the space for browsing an unidentified website that looks to be from the early days of the Internet, when the Encyclopedia Britannica was widely browsed via Netscape for book reports. As there is little knowledge to be gained from the installation itself, one might pause to consider the energy they would be willing to expend in order to understand the project. It’s recognizable that this is a research project in motion. However, the research itself is inaccessible. No conclusions have been made by the uninspired presentation of facts, and visitors can’t be expected to attend the almost daily walks and events organized to supplement the installation in Threewalls’s project space. Otherwise, the most interactive feature of this exhibit is the website, which has piecemeal paragraphs about “corridors,” “approaches,” “devices,” “narratives,” “definitions,” and “maps” along with a few other links to a blog, etc. Where does this information come from? What are we meant to learn from any of this? Chicago has an incredibly well documented and rich history regarding industry, but this exhibit reads like a bad Wikipedia entry with no conclusive evidence or analysis. The lack of vision leaves the exhibit in limbo: what is it these “researchers” are saying with this work and why should we pay attention? It is understandable that a project like this may not be concerned with scholarship and should be rooted in discovery, but the organizers must provide substance beyond a great idea and long walks through the city. For more information about the show, visit Threewalls.